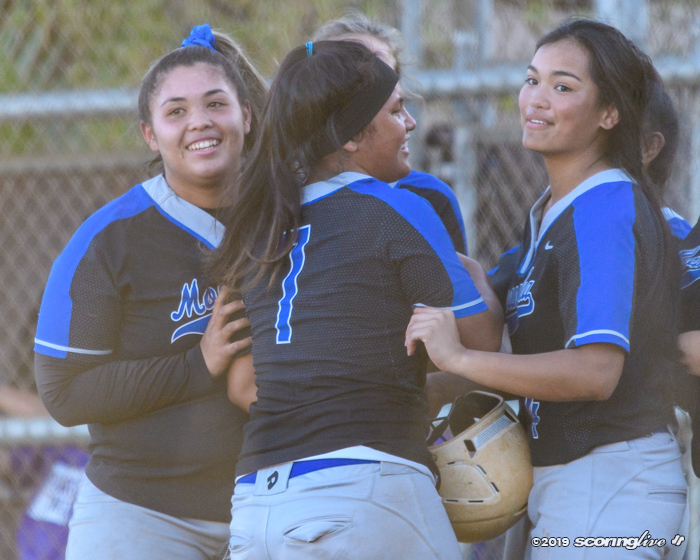 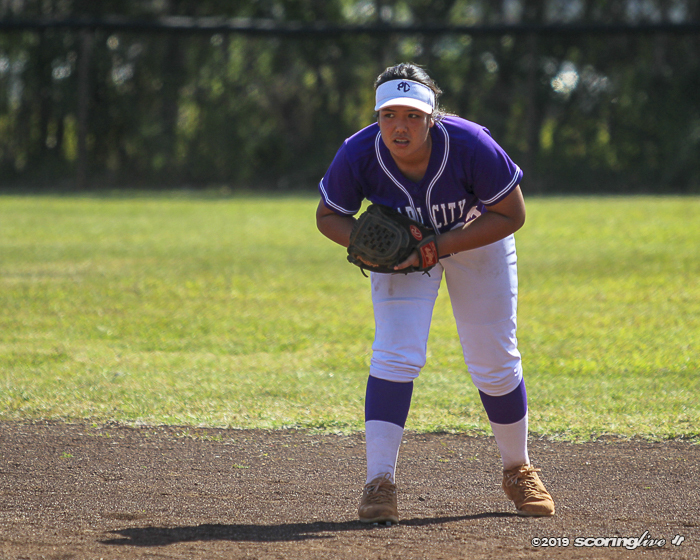 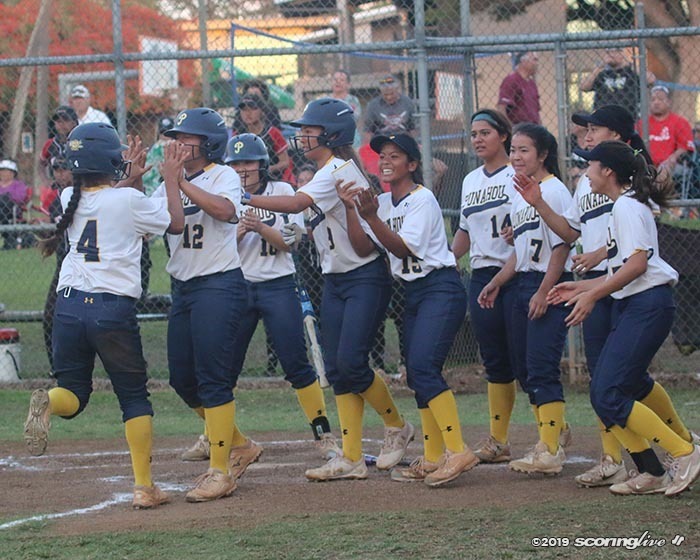 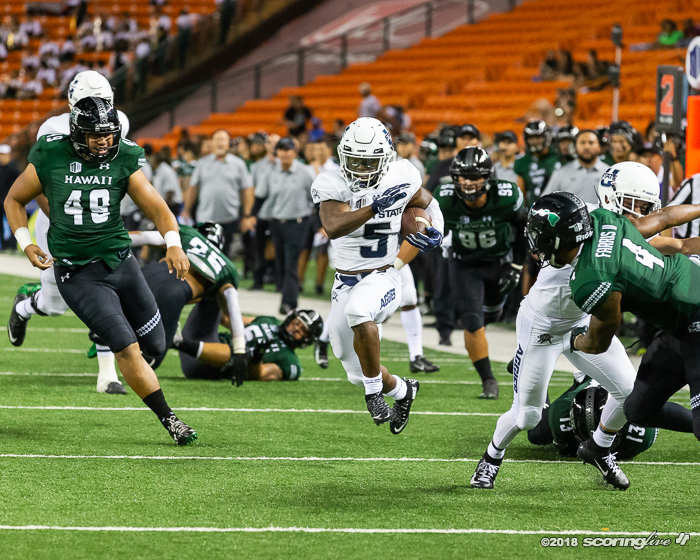 HALAWA — Two running backs scored three touchdowns apiece and No. 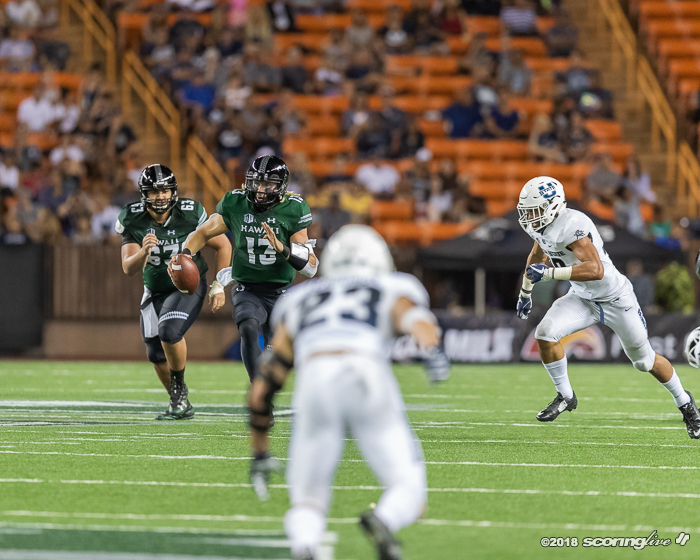 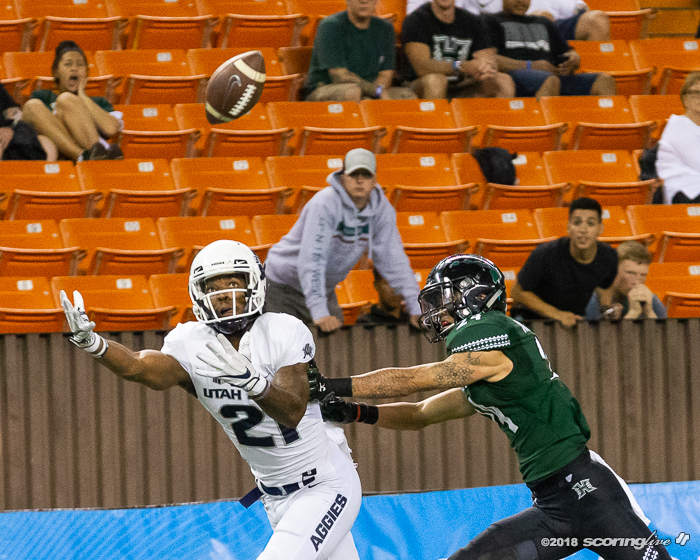 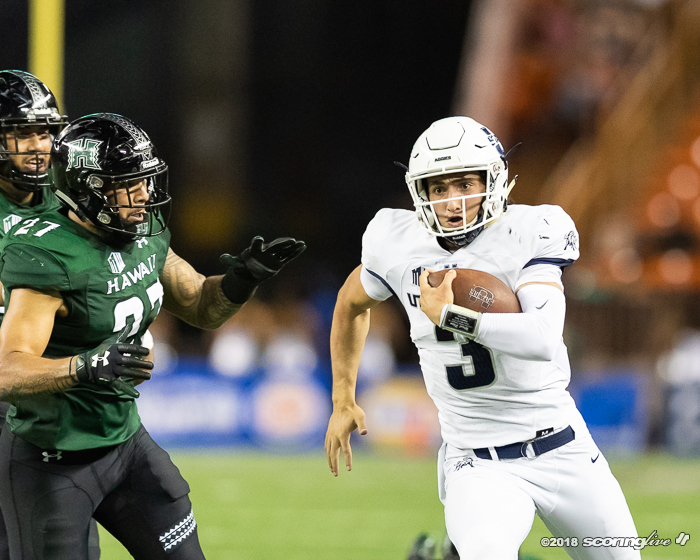 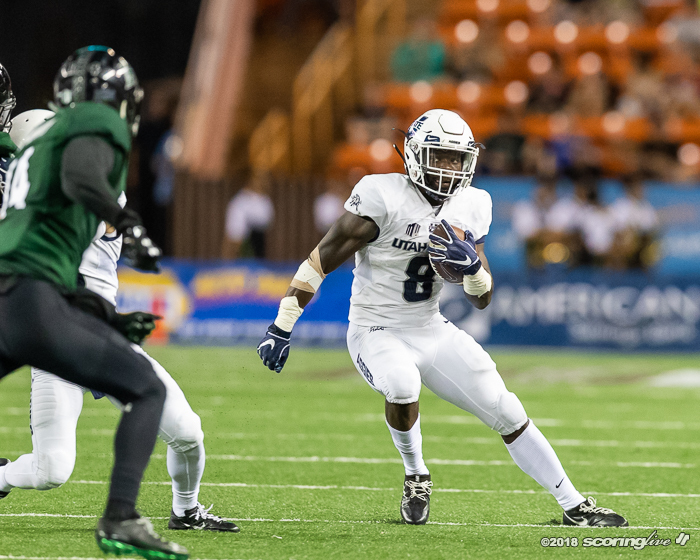 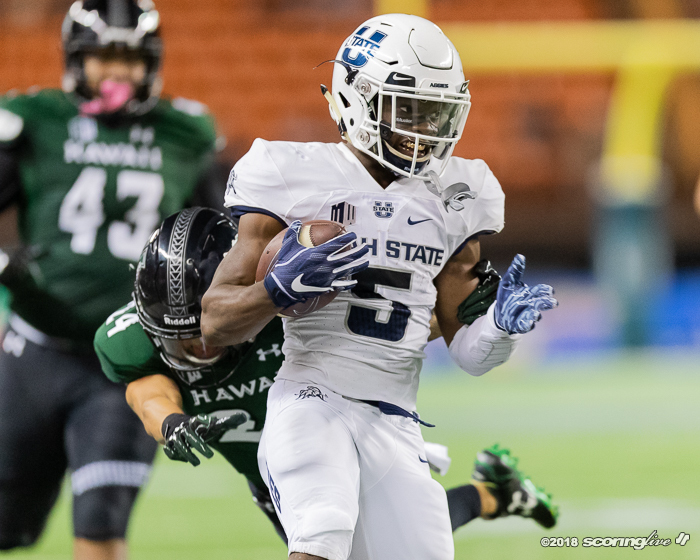 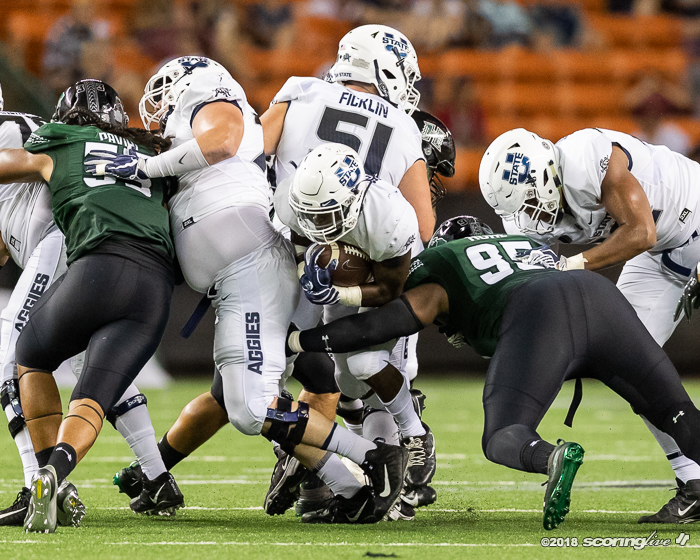 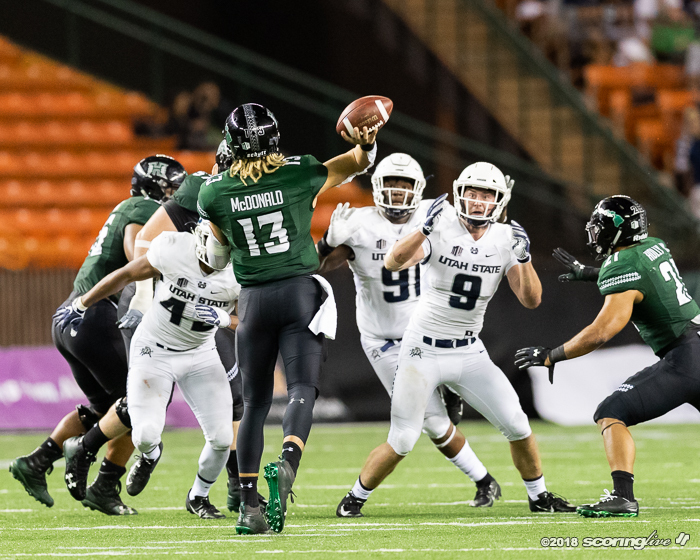 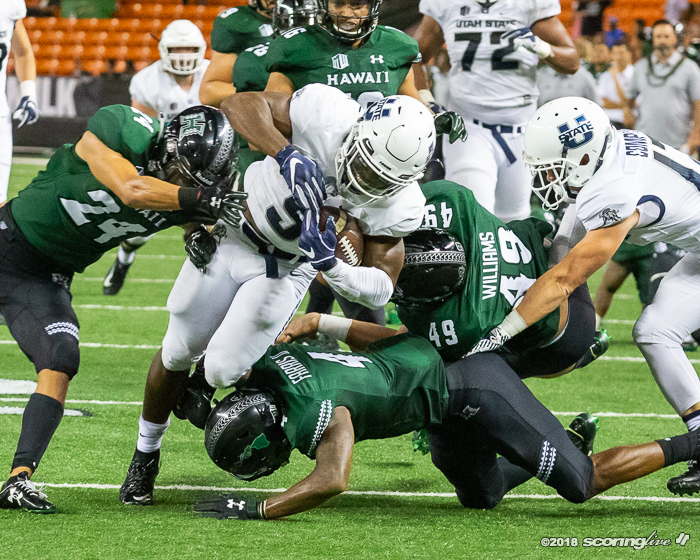 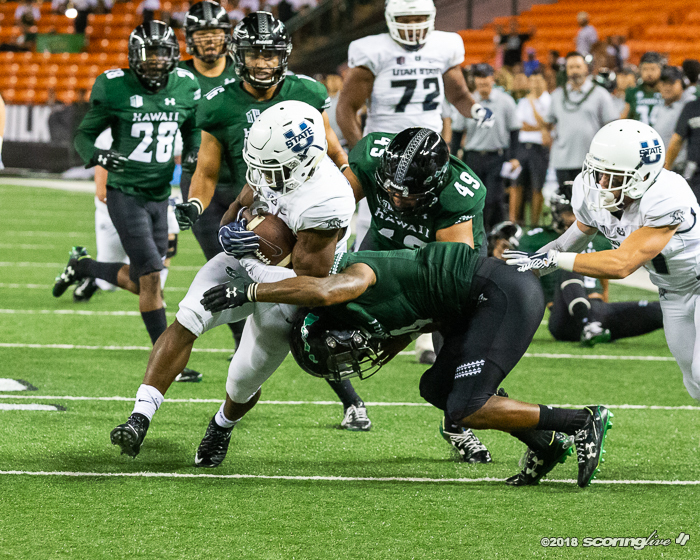 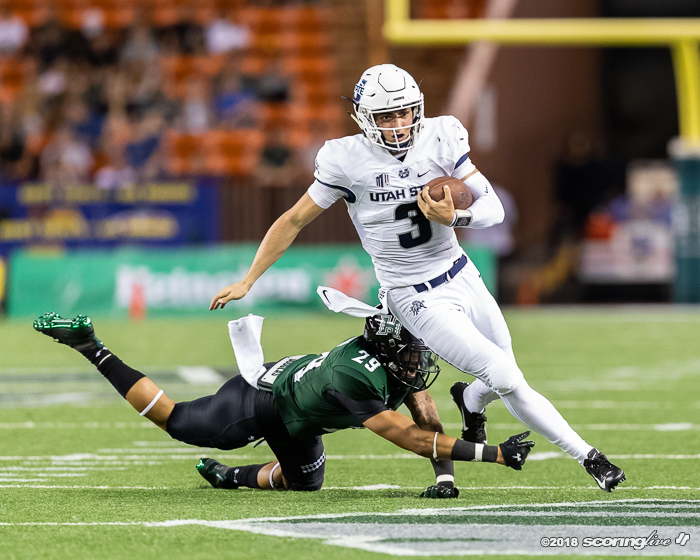 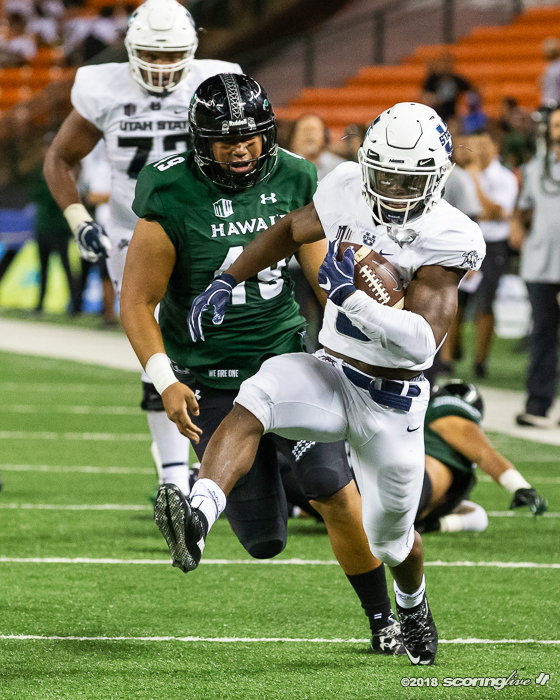 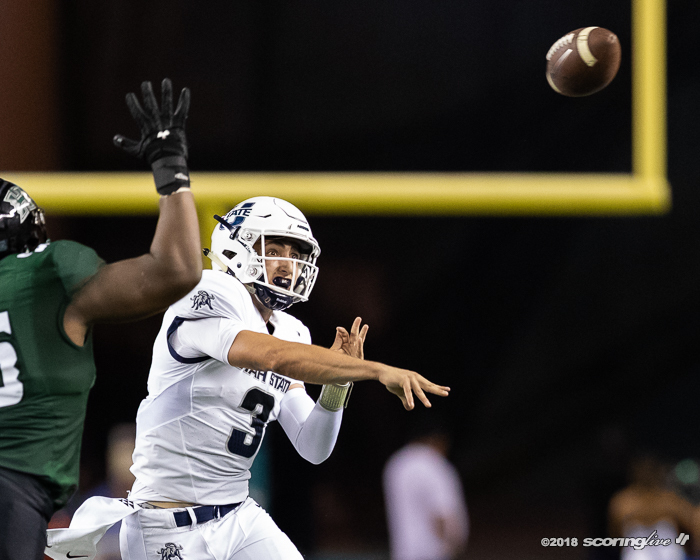 18 Utah State amassed 426 rushing yards to overwhelm Hawaii, 56-17, in a Mountain West Conference football game before crowd of 17,262 at Aloha Stadium Saturday night. 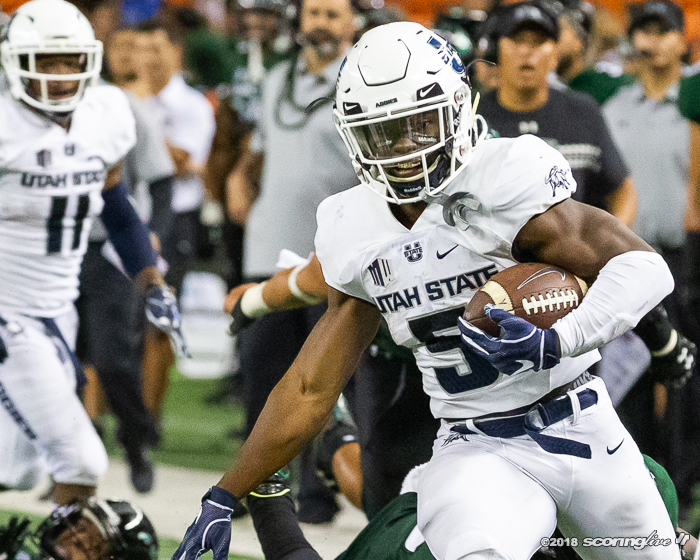 The Aggies (8-1 overall, 5-0 MW) rolled to their eighth straight victory since a season-opening loss at 11th-ranked Michigan State. 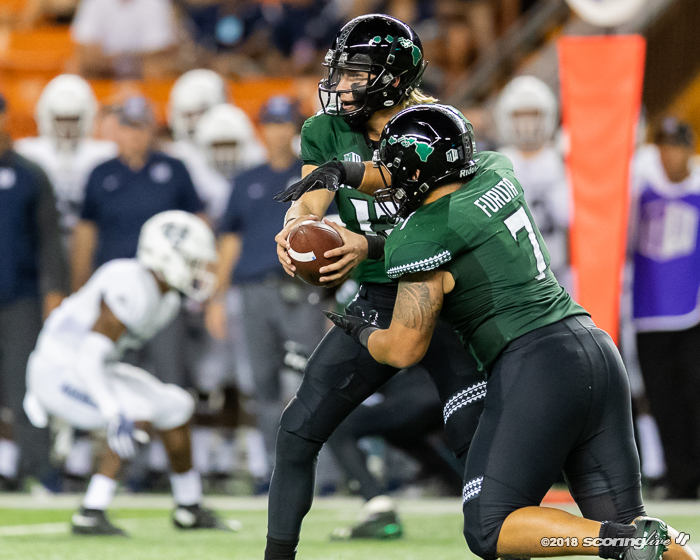 They amassed 601 yards of total offense to 390 for the Rainbow Warriors (6-5, 3-3), who suffered their fourth consecutive defeat. 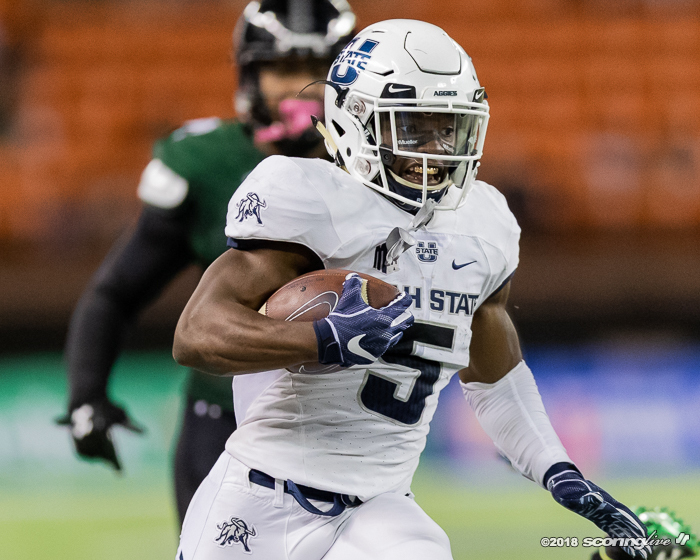 Darwin Thompson rushed for 141 yards on 13 carries and Gerold Bright added 121 yards on 16 attempts. 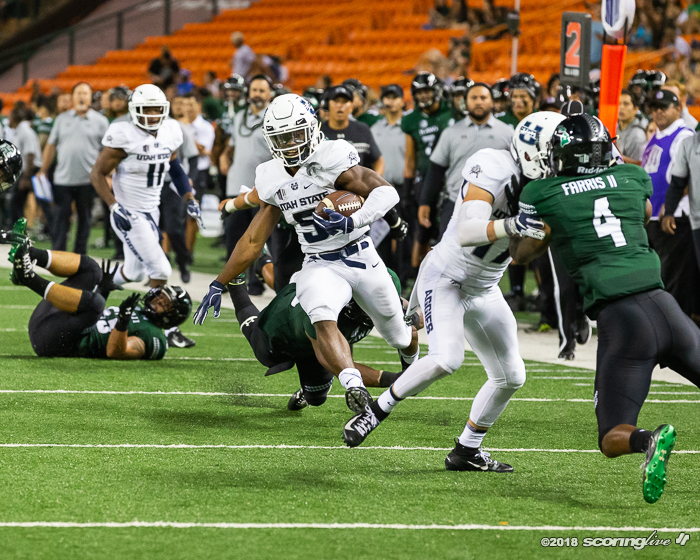 Thompson scored on a pair of 1-yard runs and a 26-yard scamper, while Bright found the end zone on runs of 18, 47 and 9 yards. 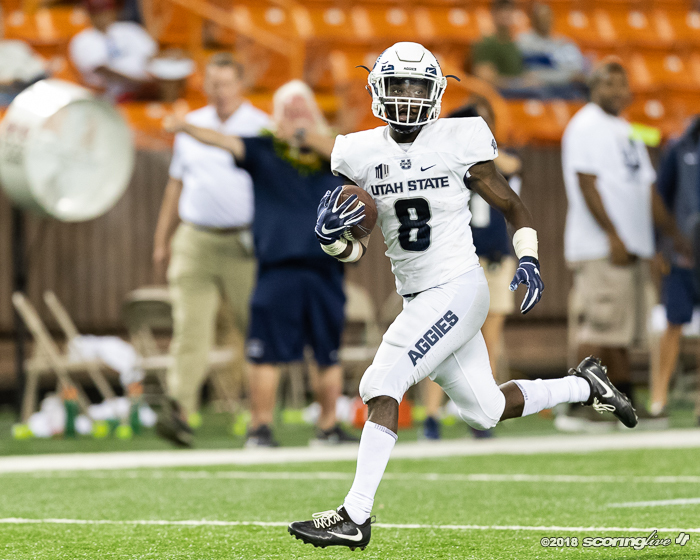 Jordan Love threw a 16-yard touchdown pass to Ron'quavion Tarver to open the scoring a few minutes into the game and also ran in another score from a yard out on the final play of the first quarter. 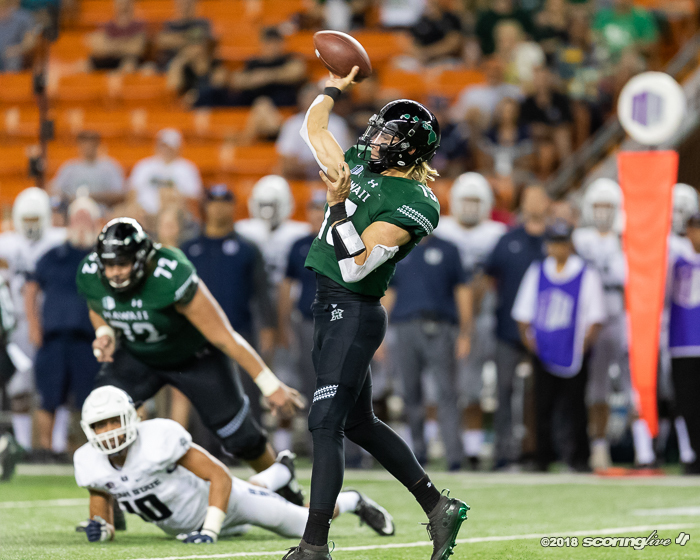 Cole McDonald threw for 331 yards with two touchdowns — both of them coming after halftime — but completed just 18 of his 45 pass attempts and was intercepted twice. 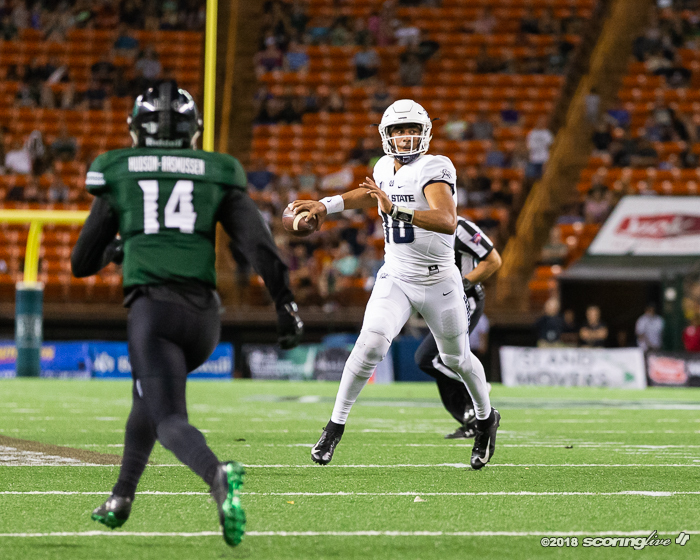 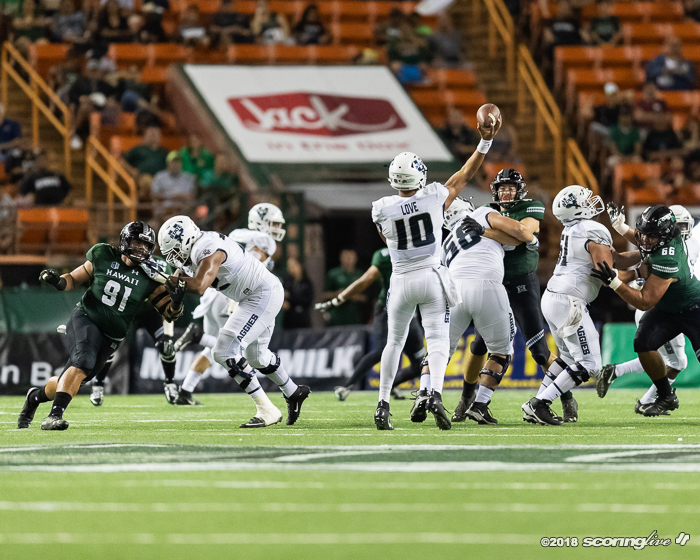 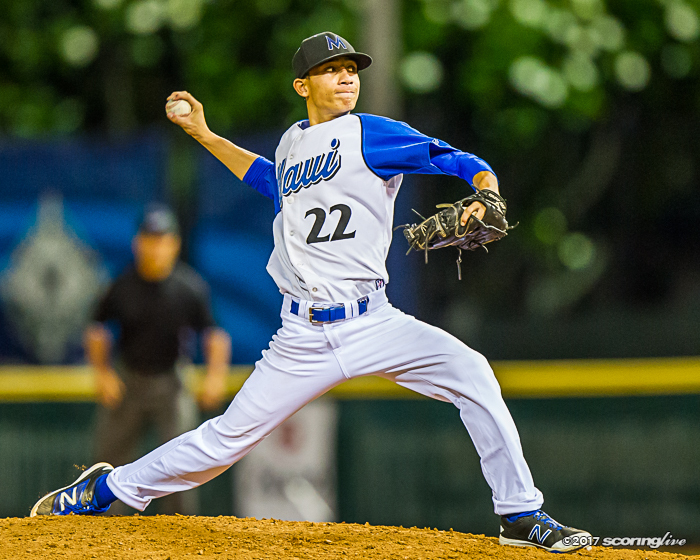 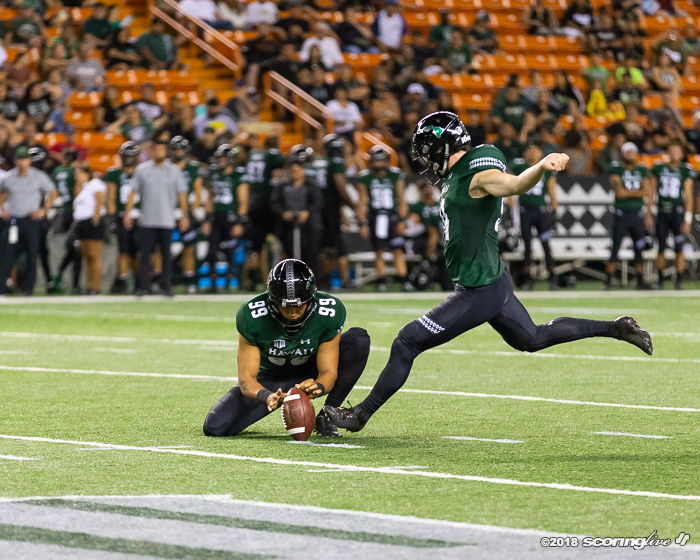 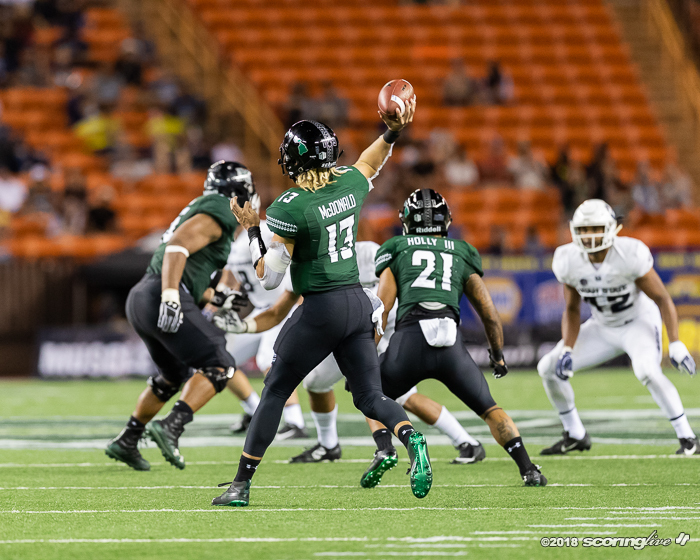 John Ursua hauled in a 54-yard scoring strike from McDonald to pull Hawaii within 35-11 with 9:17 left in the third quarter. 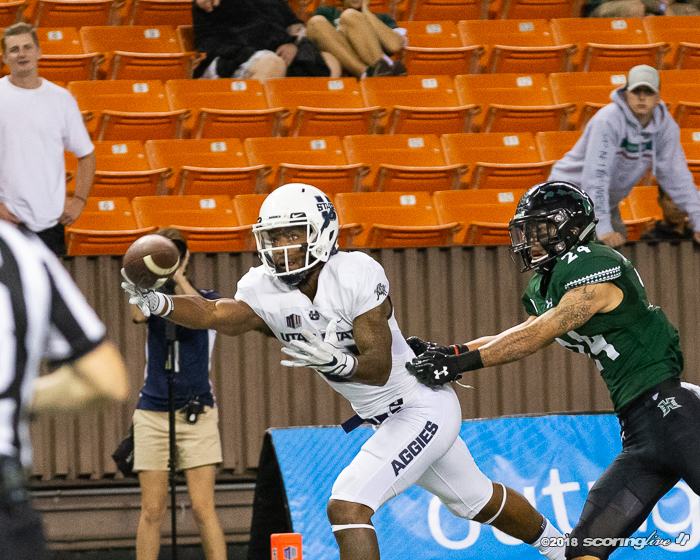 McDonald's 38-yard TD pass to Devan Stubblefield late in the third period closed out the scoring. 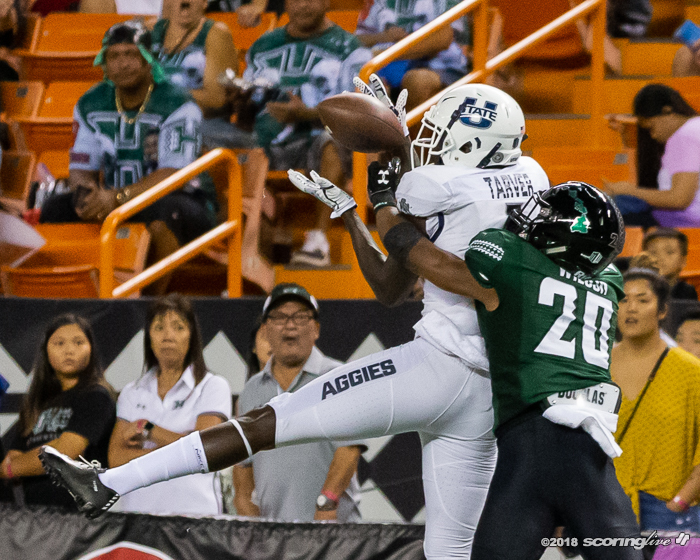 The Aggies led at halftime, 28-3. 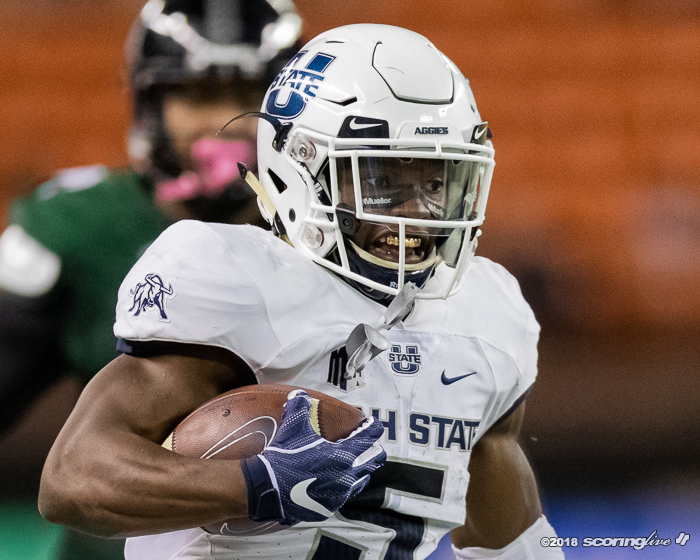 Utah State was 6 of 7 on red zone opportunities. 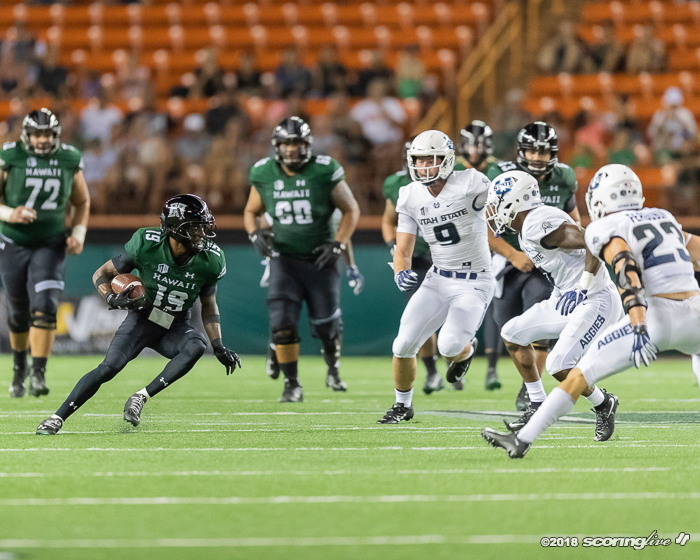 It averaged 7.7 yards per play and racked up 29 first downs to UH's 18. 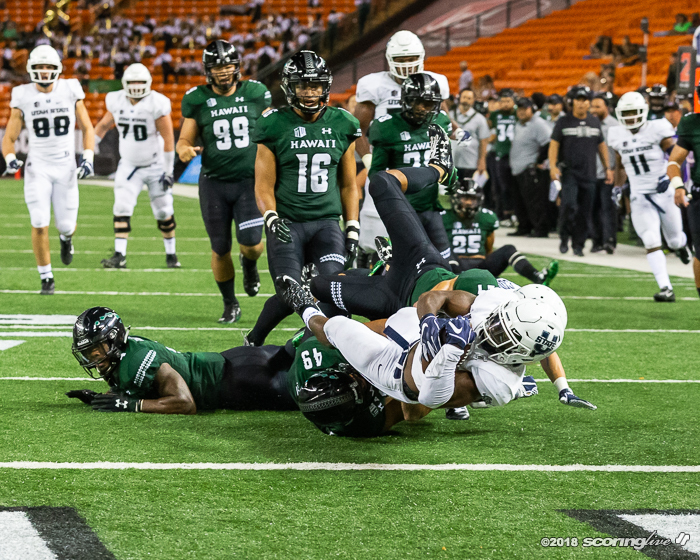 Hawaii was a meager 2 of 14 on third-down conversions and managed only 2.2 yards per rush. 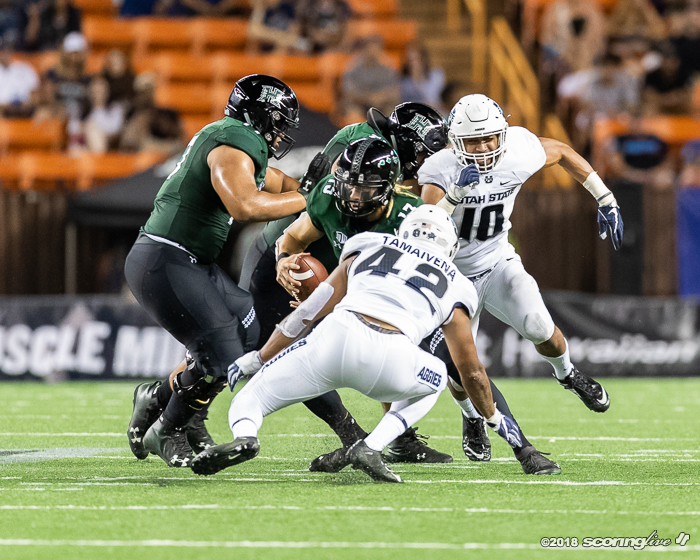 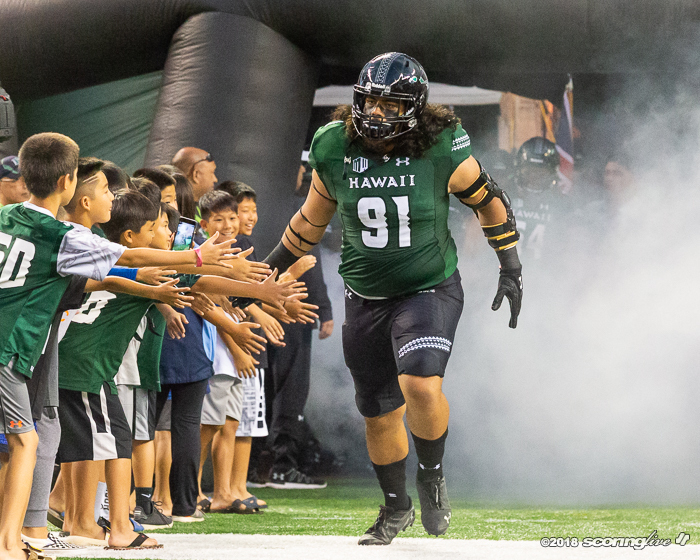 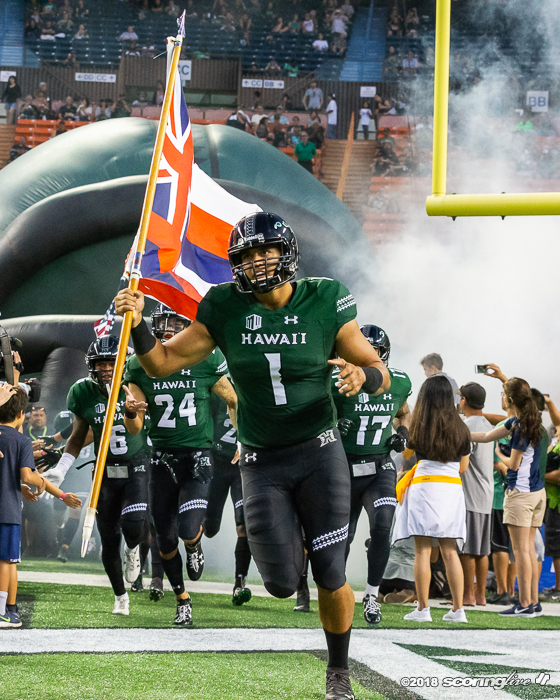 The Rainbow Warriors will have a bye next week before hosting UNLV on Nov. 17 and finishing the regular season on the road at San Diego State on Nov. 24. 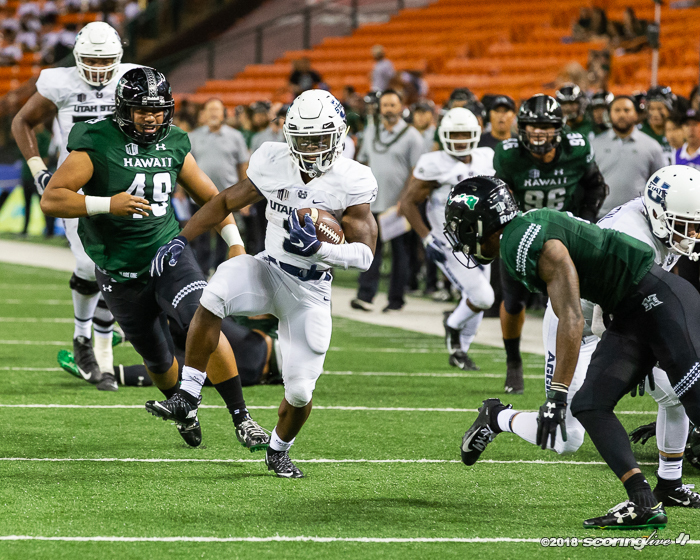 They remain one win shy of bowl eligibility.